January 2014 - Richard Davis Foundation for Young Bassists Inc. January 2014 - Richard Davis Foundation for Young Bassists Inc. Yesterday, Monday, January 14, 2014, Richard Davis was inducted into the Jazz Masters Hall of Fame. 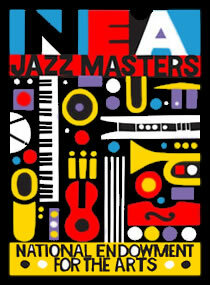 Monday night, live from Lincoln Center, the National Endowment for the Arts awarded four musicians and jazz advocates with the highest honor America bestows on Jazz musicians. The articles below capture details about the lifetime achievement award, and Richard’s reception of it. Please take a look ! Notable conference alumni, current Julliard undergraduate, Daniel Chmielinski made a television appearance this morning with his jazz combo. Dan is one of the first (and possibly only so far) students to have attended the conference for 16 years! Now with a successful career in New York, Dan is a very important part of the RDYB Bass family. Congratulations Dan! Professor Richard Davis is publicly announced as an NEA Jazz Master for lifetime achievement, the highest honor given by the United States for recognition of outstanding lifetime contributions to the advancement of Jazz Arts. See Full NEA Feature Profile Here . Congratulations, Richard!